Dr. Hooman Harooni is a board-certified ophthalmologist whose interests include general eye care as well as anterior segment disorders. He has special expertise in all corneal diseases. The reviews listed below were collected independently of Vision Associates through rater8. Each review represents an authentic and verified patient experience. Dr. Harooni is very personable and I feel he truly cares about his patients. Dr. Harooni is very personable and truly makes me feel that he is concerned about my progress ! WONDERFUL DOCTOR. MAKES YOU FEEL VERY COMFORTABLE. Friendly, prompt, knowledgeable, thorough...he's "Captain Cornea" !! Dr. Harooni is always kind and considerate and informative. Doctor is very nice and friendly with a great bedside manner. His nursing staff is great also. I will be back next year. I def recommend this place for all your vision care. Dr. Harooni has helped me with my severe dry eye. I have never felt better!! 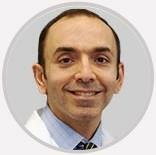 Dr. Hooman Harooni rejoined us from the Department of Ophthalmology at The GW Medical Faculty Associates where he served as an assistant professor of Ophthalmology at The George Washington University School of Medicine & Health Sciences. A native of Los Angeles, Dr. Harooni graduated with honors from the University of California, Los Angeles. He received his medical training at the University of Cincinnati, residency training at the Medical College of Georgia, and completed a cornea and refractive fellowship at The Cleveland Clinic. Dr. Harooni is a Board-Certified ophthalmologist and a member of the American Academy of Ophthalmology, American Society of Cataract and Refractive Surgeons and The Cornea Society. Dr. Harooni’s interests include general eye care as well as anterior segment disorders. He has special expertise in all corneal diseases including the latest techniques in corneal transplantation, endothelial cell transplants, refractive surgery, LASIK, and many other procedures to help with customized vision correction.